Connects your HDD to PC via Superspeed USB 3.0. The built-in top-grade ASM1153E chipset not only supports UASP (USB Attached SCSI Protocol) with a faster data transfer rate targeted for SSD, but also supports Serial ATA III bus up to 6Gbps Signal bandwidth for even faster data backups. Compatible with Windows XP/Vista/7/8/8.1/10, Linux/Android, Mac OS. Supports all standard 3.5" SATA I/II/III drives up to to 8TB. Downward compatible with USB 2.0/1.1 /1.0 connections. Made of Aluminum-alloy material, featured with an effective heat dissipation. The non-slipping rubber stand promise safety on every surface. The 12V/2A power adapter provides a stable power supply. The individual red and blue LED indicators represent power and activity status. (Solid blue LED indicates idle, flashing blue LED indicates data transfer). Please note: The PCB plate must be fixed, otherwise they will rock. 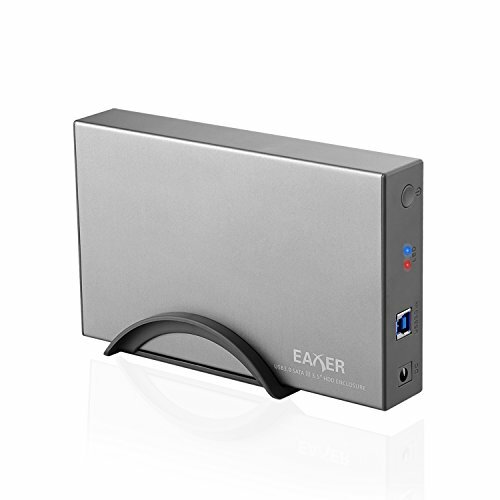 If you have any questions about this product by Eaxer, contact us by completing and submitting the form below. If you are looking for a specif part number, please include it with your message.